Kefir is a cultured, fermented beverage that tastes a great deal like a yoghurt drink. It’s made using ‘starter’ grains – just like sourdough bread has a ‘starter’. The starter for kefir is a combination of yeasts, milk proteins and bacteria. It has a tart, creamy flavour and is loaded with pro-biotic health benefits. What is water kefir? These grains are a symbiotic colony of beneficial bacteria that create probiotics and enzymes during the process of breaking down natural sugar. What is milk kefir? This is a fermented milk drink that originated in the Caucasus Mountains made with kefir "grains", a yeast/bacterial fermentation starter. It is prepared by inoculating cow, goat or sheep milk with kefir grains. 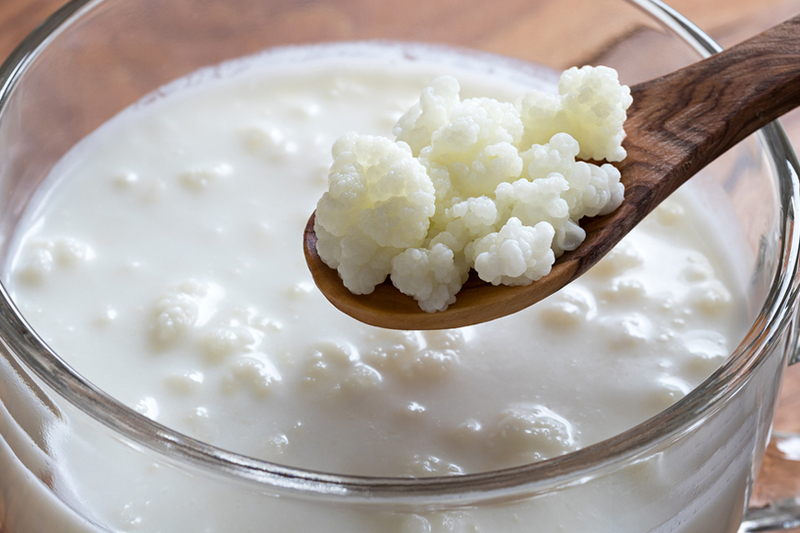 What are the benefits of having kefir? Part of the reason kefir has become more accessible and widespread nowadays is likely due to its health benefits. Kefir is nutrient-dense, and is made up of plenty of protein, B vitamins, potassium and calcium. All are believed to be good for liver detoxification, improved pancreas function, increased energy, and better digestion. Not only that, but studies have shown that consuming kefir can also have anti-inflammatory and healing effects on the body – plus, it’s beneficial in lowering cholesterol and stimulating the immune system. Though the specifics of the origination of milk kefir grains is a little shrouded in mystery, one thing that has been made clear: milk kefir grains must be acquired. They often come in either a fresh or dehydrated state. The easiest way to get hold of kefir grains is to get them from a friendly already making kefir at home. A simple search in any Dubai community group on Facebook, or via our ExpatWoman forum will result in various individuals offering to share their kefir grains. Otherwise – you can order starter packs online that will help you to start growing your own kefir cultures at home. Once you have your kefir grains – whether fresh or dehydrated – there’s just a few steps to take to activate your milk kefir. Fresh grains are more delicate, but dehydrated ones will need a bit more TLC to activate. As kefir grains are living organisms, they require food in the form of milk. During the activation process, you will be feeding them increasing amounts of milk over a 3 to 7 day period, going from 1 to 4 cups. Here’s our complete guide on how to make milk kefir at home. You’ll want to watch them carefully during this activation process, to make sure they have an adequate amount of milk and don’t starve. Is kefir illegal in Dubai? There’s a legal grey area regarding home-grown, fermented products. But despite this, kefir is widely available already in milk kefir form – and can be ordered online via grocery stores, or even found in your local supermarket like Choithrams or Bio Organic. Is kefir the same as laban? They’re similar – but not exactly the same. Laban is a drink that is traditionally prepared by allowing milk to ferment for around 24 hours, then churning and removing the butter. The remaining buttermilk is kept for several days at room temperature. It’s more of a yoghurt-based drink, and is widely popular in Dubai and UAE in general. Whereas Kefir isn’t like yoghurt. Milk kefir is a “mesophilic” culture, which means it cultures at room temperature, despite which type of starter culture you use. Plus, Kefir actually has a far larger range of bacteria compared to yoghurt and laban. Can I drink kefir if I have a lactose intolerance? What are the side effects of kefir? While kefir has great health benefits, it also has some side effects if consumed in large quantities. These include constipation and abdominal cramping. These side effects are most common when you first start taking kefir. Kefir is considered safe for consumption by children between 1 and 5 years of age, but do consult their paediatrician first.